I’ve become kind of obsessed with cauliflower. Lately, I’ve been eating it almost every day, with beet hummus, for breakfast scrambled with eggs, instead of rice with Indian food. And then Sarah and I decided to combine our powers for good and make a colorful, healthy lunch totally based on cauliflower. I am NOT on the low-carb bandwagon. Wheat would have to go extinct for me to give it up for the rest of my life. Despite these truths, I really love replacing grains with cauliflower. Here’s the thing. I am the type of person who wants to spend time eating. It’s hard for me to feel “done” eating if my plate is clean in five minutes or less, even if I’ve actually had enough calories to fill me up. This is why vegetables, and cauliflower specifically, are amazing. More volume for less calories, longer meals with less overeating just because I still have the munchies. 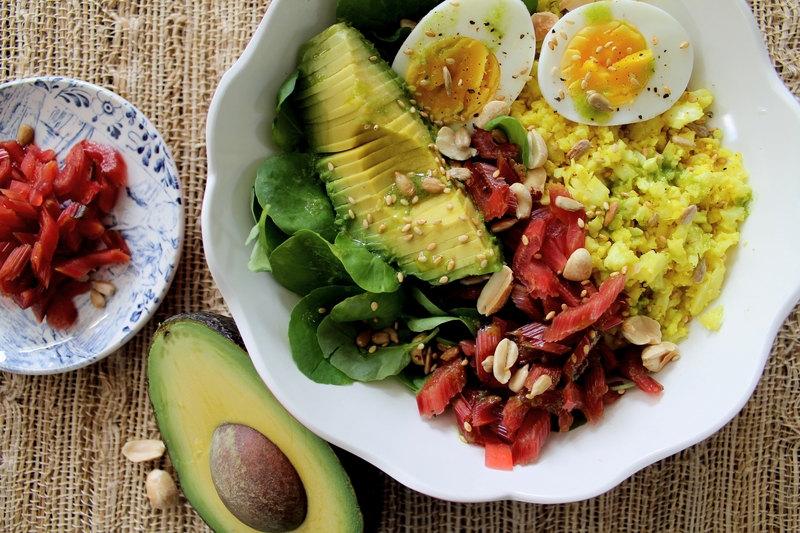 This rainbow bowl is delicious and surprising. There are a lot of components, but all together they make an incredibly satisfying meal! 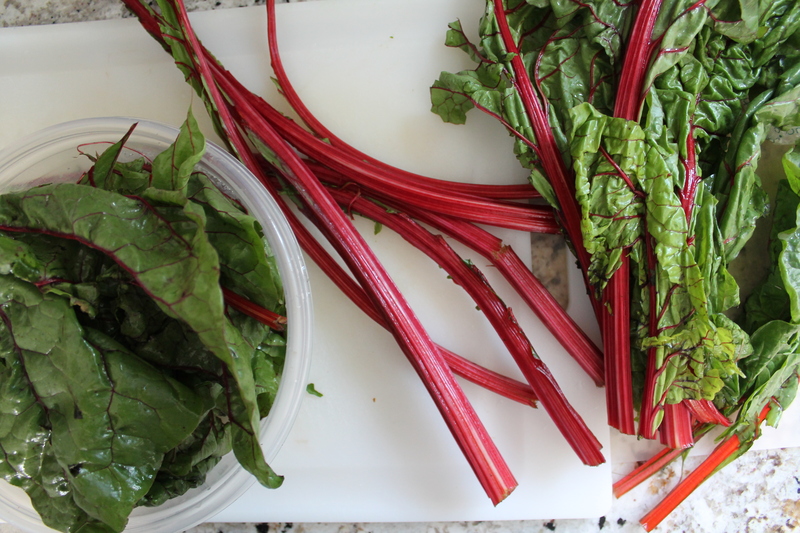 Rinse the chard and dry gently, then slice the stems thinly on a bias. Salt the stems and let them sit while you prepare the pickling brine. First, toast some mustard seeds in the bottom of a dry saucepan, just for 1 minute. Add in the vinegars and sugar. If you don’t have raw sugar, plain white sugar is fine! Throw in some minced shallot or red onion with a pinch of salt. 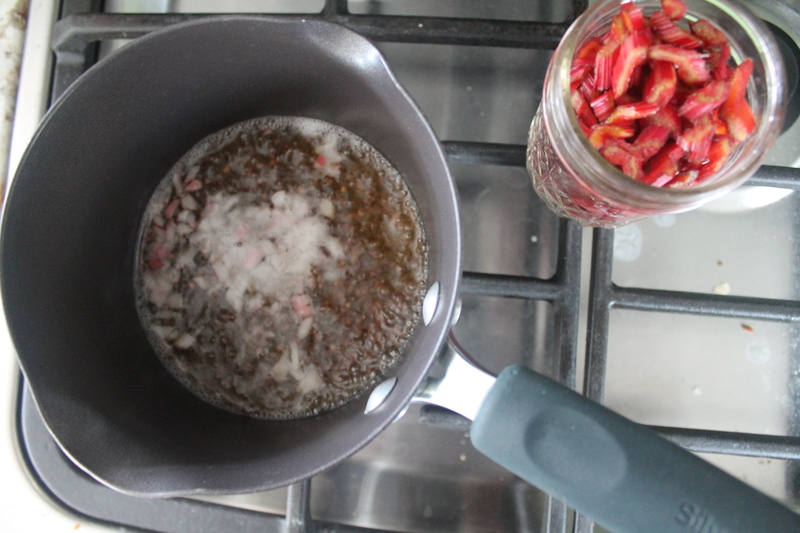 When the sugar has dissolved, remove the brine from the heat. 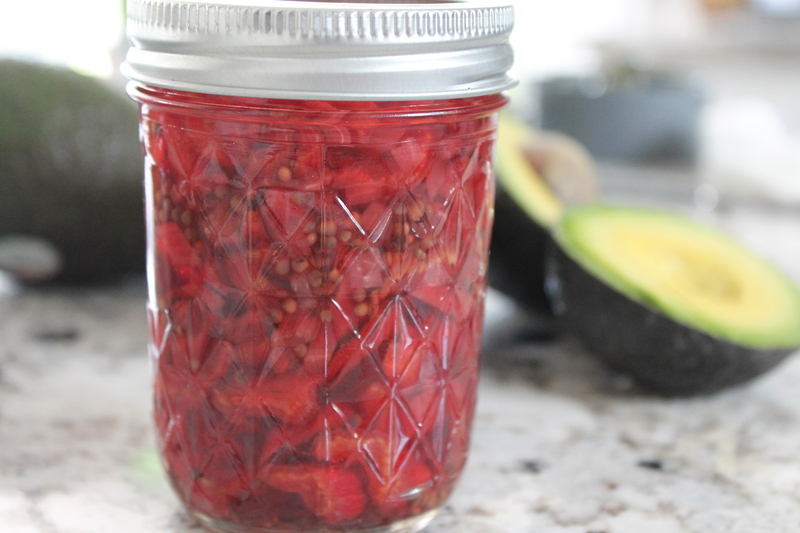 Transfer the chard stems to a small, glass jar that has an airtight lid. Pour the brine over top. If all of the onions and mustard seeds end up sitting in a layer on top, use a fork to gently jiggle the chard stems until everything is fairly well mixed. Close tightly and allow to sit on the counter. If you are not planning to use the pickles right away, let them cool completely and then store the jar in the fridge. However, since these are supposed to be quickie pickles, it’s also fine to move straight ahead toward the rest of the rainbow bowl! As I said, there are many components to this bowl. We have to make cauliflower “rice,” chive oil, and toasted nuts and seeds. And don’t forget hardboiled eggs! 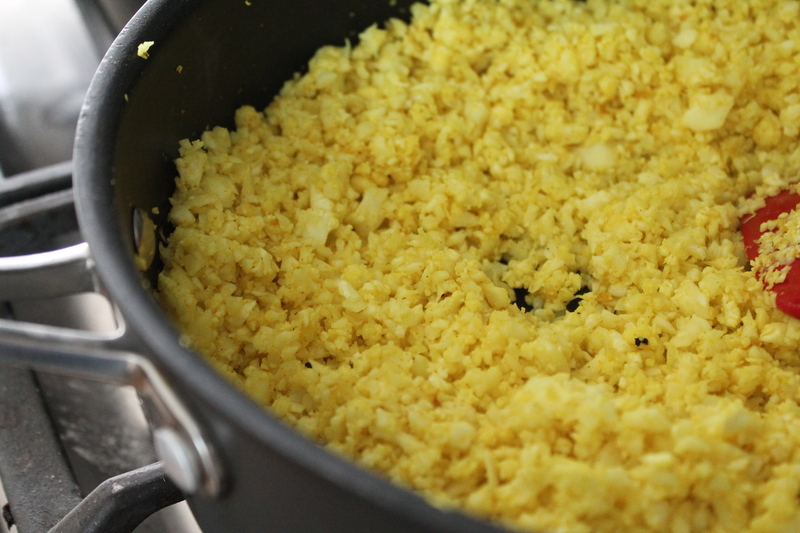 Cauliflower rice is so simple, assuming you have access to a food processor. 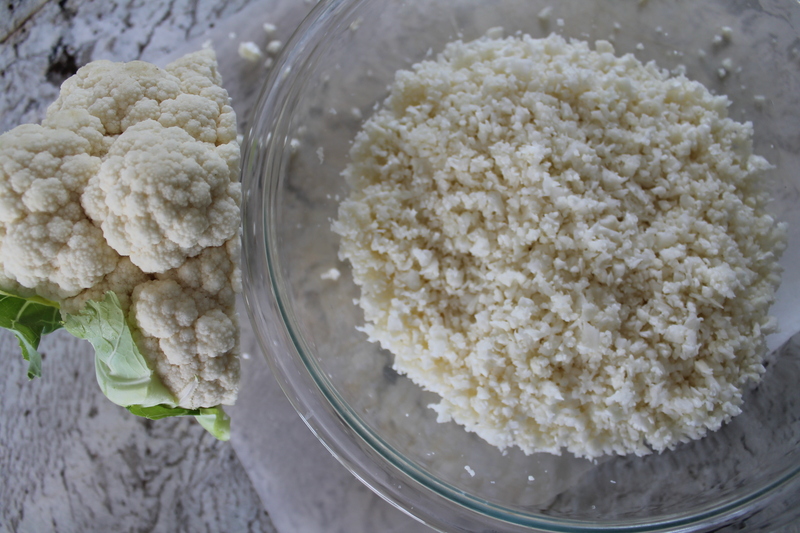 Simply toss as much cauliflower as you want into the food processor, raw, and blitz until it is fairly fine and even. It’s okay to leave a few larger pieces in there for texture, but nothing bigger than an eraser head. For this recipe, Sarah and I roughly pureed half of a large head of cauliflower, which made between 3 and 4 cups of cauliflower rice. Scrape the cauliflower into a microwave-safe bowl and cover tightly with plastic wrap. Heat for 2 minutes in the micro, just to soften slightly without allowing it to become mushy. Uncover to release the steam when the microwave stops. At this point, it can sit on the counter or in the fridge for ages. Finally, lets get some toasted nuts and seeds going. Sarah and I used peanuts (which were interesting and surprising in the dish, but I might use cashews next time), sunflower seeds, and sesame seeds. My sesame seeds were pre-toasted, but we dumped the sunflowers and peanuts onto the same cookie sheet together. Simply toast in the oven at 350 for 5 minutes, shake the pan, and continue toasting another 5 minutes. We want them warm and fragrant, but not too deeply browned. Now. Let’s add some spice to that cauliflower. Warm some coconut oil over medium heat, then add in warm Indian spices: turmeric, cumin, a pinch of cayenne, and some fresh pressed garlic. Stir this around with a spatula until the turmeric stops smelling raw and the spices form a thick paste. Toss in the cooked cauliflower and stir until the spices are evenly mixed in and the cauliflower is yellow. Try not to keep the cauliflower on the heat too long. Okay. We have yellow cauliflower, we have chive oil, we have lightly pickled chard, hardboiled eggs, and toasted seeds+nuts. Let’s do this! 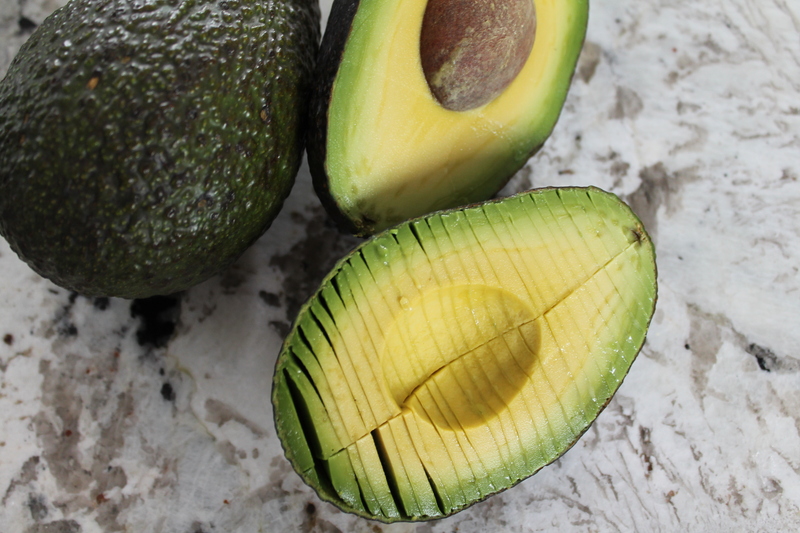 The final ingredients are sliced avocado and some kind of greenery. Ideally, you would use microgreens, which will easily scoop with the rest of this salad; we used small watercress. Clover sprouts would work, as would chopped baby spinach (or, hey, chopped chard leaves). Take your pick! Spoon the cauliflower rice into four deep bowls. Divide the chard pickles among the bowls, discarding the brine. 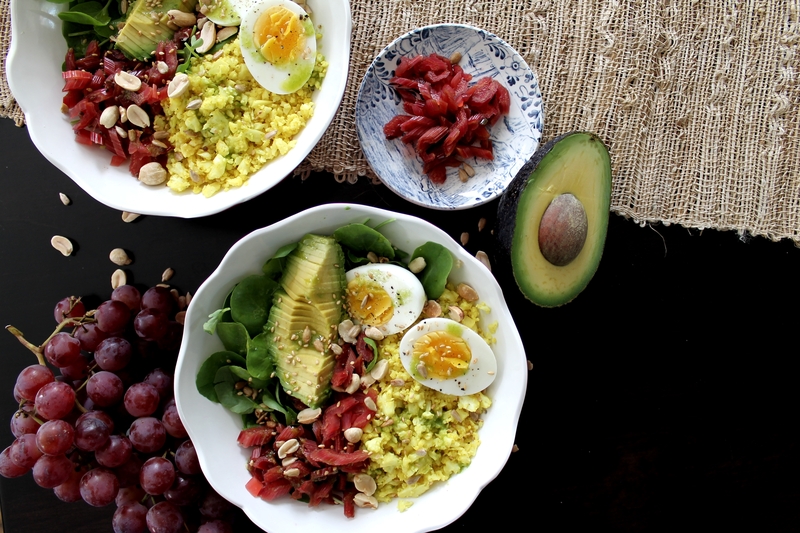 Nestle the greens, sliced avocado, and one or two hardboiled eggs into each bowl, then sprinkle with toasted seeds+nuts and a generous drizzle of chive oil. Sprinkle the sliced chard stems lightly with salt and let sit for 10 minutes. Meanwhile, toast the mustard seeds in a small saucepan for 1 minute over medium heat. Do not allow the mustard seeds to burn or pop. Add the vinegars and sugar and bring the liquid to a boil. Reduce to a simmer and add the red onion. Cook another 3–5 minutes to soften the onion and dissolve the sugar completely. Remove the pan from the heat. Place the riced cauliflower into a microwave-safe bowl. Cover tightly with plastic wrap. Microwave on high for 2 minutes. Immediately uncover to release the steam. In a saucepan, heat the coconut oil. Add the turmeric, cumin, garlic, and cayenne. Cook, stirring constantly, until a warm paste forms. Stir in the cooked cauliflower. Season to taste with sea salt, then remove from heat. Set aside. Combine chives, olive oil, and a pinch of sea salt in a blender and puree until uniform. Assemble the cauliflower bowls. Divide the cauliflower evenly among 4 large bowls. Top with chard pickles (discard the brine), greens, sliced eggs, avocado, nuts, seeds, and a generous dressing of chive oil. Add a few grinds of black pepper, if desired. 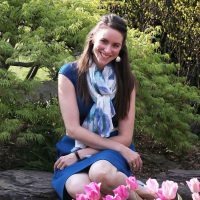 Finally wrote my post, lol!